One of the world’s greatest art museums, the Metropolitan Museum of Art — aka the Met — is so vast you could easily spend days inside. This 2- or 3-hour tour cuts to the chase, taking you straight to the collection’s highlights for an in-depth look. A knowledgeable guide introduces you to a broad spectrum of art, jewelry, ancient relics and architecture on this small-group tour, limited to 15 people. Booking this tour allows you to skip the entrance line, and from May to October, you'll also visit the rooftop garden for views over Central Park. 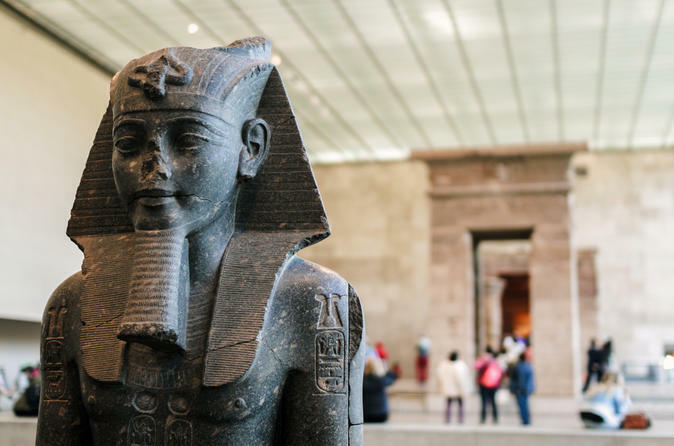 The immensity of the Metropolitan Museum of Art's collection, with works spanning six continents and more than 6,000 years, is what makes the museum such a world-famous attraction but can also overwhelm visitors. With this tour, however, you'll leave the careful planning to your guide. All you have to do is show up, meet your guide in the main lobby, and prepare to see a vast range of art, sculpture, jewels, artifacts and architecture. Select either a 2- or 3-hour tour that will have you traversing the globe without leaving Central Park. Your pre-booked ticket also ensures you won’t waste time standing in line. See the Itinerary below for details about each option.